Do not hesitate to use our Forum and post any shell related question. Collectors will answer you. 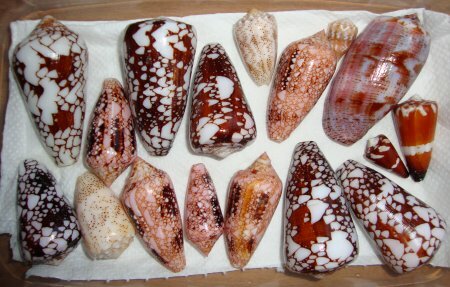 First of all, the method of cleaning seashells truely depend of the family/specie of shell you want to clean. If the shell is naturally polished and shiny (like cowries, Olividae, Marginellidae,...), avoid the use of any material to make it shine more !! You may damage it !!!!!!!!!! a bad looking appearence because of sea-concretions which colonize the shell. The best way, is to put the shell in the freezer for at least a day (prefer 2-3 days). boiling water and do not put it in the sun rays action, it is not necessary). Careful not to let the "decomposition juice" (liquid) which will come out (ooze) of the shell during the unfreezing step !! 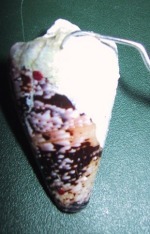 For this purpose, put the shell in a small container filled with sand, like this : the syphonal shell's canal (= channel, = tube) down (so the shell is vertically positionned). M. Lebeon Roger (France) mailed me to tell us that is is much better to freeze-unfreeze several times. 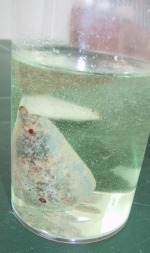 It makes the mollusc become really mushy "liquid" and then very easy to wipe out with a strong water jet. 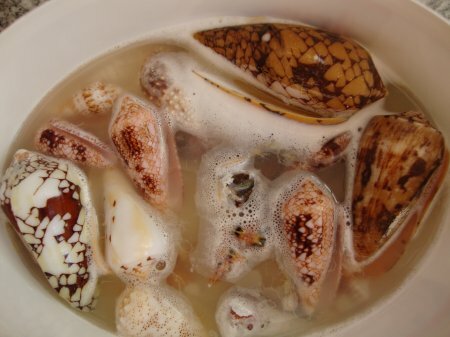 In order to finish the job, you will need to clean the interior (a little part of the mollusc often stays in the shell). The fastest way is to use a strong water jet (carefull not to let the shell fly away with the water pressure...). If you cannot, you still can use the ants action by leaving the shell outside for several days (hide from the sunlight). 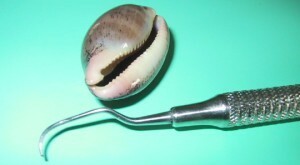 For big enougth cowries (3 cm at least), you may try the strong water jet before using dental instrument. The mollusc might get out by itself and leave nothing behind. But it must be totally unfreezed !! To avoid the bad smell which may appear, you can put the shell in several chimical products, depending of the shell family. 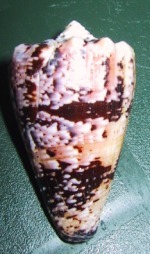 For natural shining shells (cowries, Marginellidae, Olividae,...), just put the shell in 90% at least, alcohol (ethanol). Then, if the smell persists, you can carefully put a very small quantity of pure bleach, the most concentrated possible that you can find (32°, 48° at least), in the shell's aperture. Beware not to let the natural polished exterior parts in contact with bleach (cowries, Marginellidae, Olividae,...), you will irreversible damage the shell !!!!!!!!!!!!!!!!!!! Leave soaking for a day and then take the bleach out (if not evaporated). 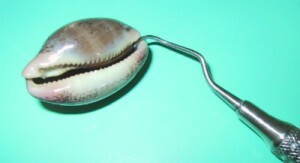 Avoid puting any naturally polished shell like cowries with part of the mollusc in water, or do not leave it more than few minutes, it may damage the shell. The first sight of such damage will be an irreversible rainbow-like ray on the dorsum of the cowrie. 2. Alternative solutions Of course you can let the ants eat the entire shell by burying the shell in sand or earth. If you find shells while traveling, have no freezer and if the shell is small enough you can put it in alcohol and try to bring it back in an hermetically sealed container with alcohol if possible. 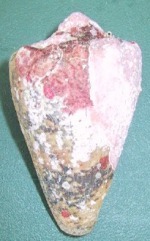 The alcohol action is to dry the shell. After of course it is much more difficult to take the mollusc out. And anywhere you will go shelling you will be able to find alcohol. You can use any high degree alcohol like rhum. 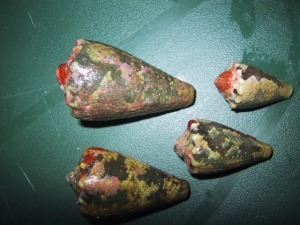 Murex shells (Muricidae) are often very difficult to clean. There is always a part of the mollusc inside. You can boil the shell, it won't damage it ! And it will be very easy to take out the entire mollusc. The best way is to freeze, then unfreeze and then boil. 3. Cleaning the exterior of a non naturally-polished seashell which have often a bad looking appearence because of sea-concretions which colonize the shell. Some of families that are not concerned by this section : Cypraeidae, Ovulidae, Triviidae, Olividae, Marginellidae, Bullidae,.... Fill a hermetically sealed container with pure bleach (at least 32° or 48°). Soak a few days (at least 24h). Then take it out, it should be better. But anyway, it will always have some white concretions. Use a thin instrument (like the dental purpose ones, as described above) to take them out slowly the stratum of crusted algae and corals. When the shell is nice looking, it may still need some help to look more polished. You may use only one thing : parraffine oil (=Mineral Oil, found in pharmacy stores). It will make your Conus, Murex, Cassis... really shine !! This oil should not damage the shell. M. Lebeon Roger (France) mailed me another tip about chimical product which would make shells shine much more without any damaging : cars (auto) silicon-lubricant sprays. I never tried it before, but he did and does not seem to have any problems. Well, this is very easy. Get some pure bleach (at least 32° or 48°). Leave the shell for at least several hours (prefer a day). The shell should loose this thin yellowish stratum very fast !! 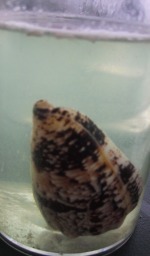 remove the shell and use water to clean and let dry. Then use paraffine oil (=Mineral Oil) to make the shell shine like described above. The best way to have your shells remain as the day they were found, is to protect them from several damaging conditions : air, sun, human touch & dust. You should put them in hermetically boxes, far from the sun's damaging rays. If you want to get one to show it to people for example, try to touch it the least possible. 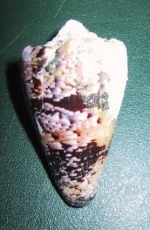 For natural polished shells like cowries, use a duster (rag) to clean it after it has been touched. Because you will leave some oil (grease) on the shell which may damage it. 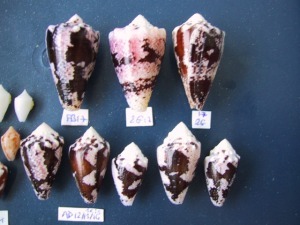 You can find many more infos on the "Storing seashells" page. Shells (Cone shells) Soaking... in bleach. Take care to your fingers if highly concentrated.